A simple little cookie for M day! I used Watermelon and Melon Fusion flavored jello to spinkle on top. Preheat oven to 225 degrees F. Beat egg whites and cream of tartar in small bowl with electric mixer on high speed 5 minutes or until soft peaks form. Gradually add sugar, 1 Tbsp. at a time, beating on high speed until stiff peaks form. Drop tablespoonfuls of the egg white mixture onto baking sheet covered with parchment paper. 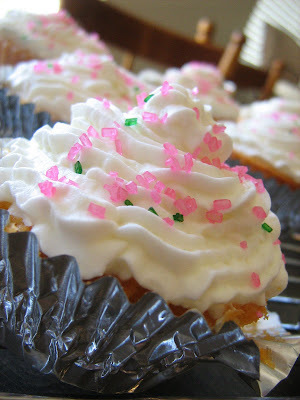 Sprinkle each meringue lightly with dry gelatin powders. Bake 50 minutes. Turn oven off. Prop oven door open slightly; let meringues stand in oven for 1 hour or until completely cooled. 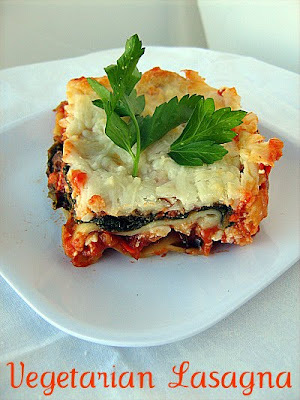 This is my go-to lasagna recipe. It is so easy and chock full of veggies. It is also versatile, you can used canned mushrooms instead of fresh, frozen spinach instead of fresh, canned pasta sauce, etc. It is good! Cook lasagne noodles according to pkg directions. Meanwhile, rinse spinach and place in saucepan. Cover and cook over medium heat until steam forms, then reduce heat and cook for a few minutes. Drain and set aside. In a large heavy saucepan, melt butter and saute carrots, onion, and mushrooms, until tender but not brown. Stir in tomato sauce, tomato paste, olives, oregano and basil. set aside. Combine cottage cheese and egg. In a 9 by 13 inch pan sprayed with cooking spray, layer half each of noodles, spinach, sauce, cottage cheese mixture, and shredded mozzerella. Repeat layers ending with shredded cheese. Bake at 375 degrees F for 30 minutes. Let stand 15 minutes before serving. I have been secretly wanting to enter Cupcake Hero for a few months. I was just so intimidated by all the talented people out there, their cupcakes, pictures, etc. Well, I got over it. I decided to tackle it this month because the theme is Melon. My favorite food is watermelon. I love it. It just speaks summer. It is so refreshing and yummy. Cupcake Hero was thought up by Laurie. A different theme is chosen each month and then the entries are tested and 1 is declared the winner. This month we are having a guest host, April over at Abby Sweets. 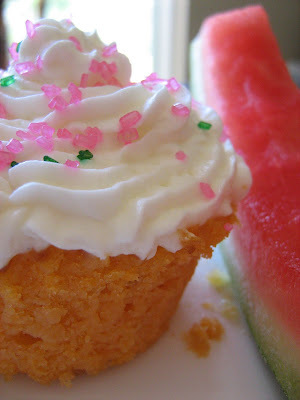 I decided to go with watermelon as the melon for my cupcake. When I was eating my fave fruit salad ever, Watermelon and Nectarine Salad, which has a wonderful lime syrup, I decided watermelon and lime would be a great combination. I thought the white chocolate mousse I used to top my opera cake for last months Daring Baker's challenge would be the perfect topping. Pipe a little lime curd in the center and there you have it, my first entry into Cupcake Hero. 1. * To make watermelon puree and juice, combine 3-4 cups cubed, seeded, watermelon and the juice of 1/2 lime in a blender. Blend until liquidified. Strain through a sieve until thick solids are left in strainer and juice is left in a bowl. Fill 1/4 cup measure with a heaping amount of the thick solids (puree). Set aside puree and juice until needed. 2. Position a rack in the center of the oven and preheat to 350°. Line muffin pans with paper liners and spray with Crisco baking spray with flour. In a medium bowl, combine the flour, baking powder and salt. In a separate bowl, combine the buttermilk and juice of 1/2 lime. 3. Using an electric mixer, beat the butter on high speed until creamy, about 1 minute. Add sugar and the lime peel and beat until fluffy. Add the egg, and beat until combined, scraping down the sides. 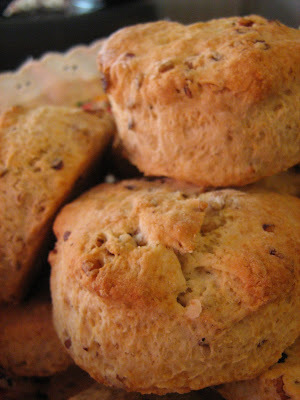 On low speed, beat in a third of the dry ingredients, then a third of the buttermilk mixture. Repeat, alternating ingredients, until the batter is smooth. Then beat in the watermelon puree, watermelon juice, and dry jello powder, beating until smooth. 4. Spoon the batter into each liner, about three-quarters full. Bake until a toothpick comes out clean, about 26 minutes. Let cool on a rack. 5. Once the cupcakes are cool, stir 1/2 jar of lime curd in a bowl until smooth. Pipe into center of cupcakes. 7. Refrigerate until cake is chilled and then serve! Stir to ensure that it’s smooth and that the chocolate is melted. Set aside to cool completely. I needed to make a cookie bar that everyone would love and so I pulled this cookbook from the shelf- All-Butter, Fresh Cream, Sugar-Packed, No-Holds-Barred Baking Book by Judy Rosenberg, owner of Rosie's Backery. Sure it was printed in 1991, but that doesn't mean the recipes are outdated! I chose this recipe because everyone loves peanut butter and chocolate and subbed in some m&m baking bits, just for fun. Preheat the oven to 350 degrees F. Lightly grease a 11 by 7 inch baking pan with butter or cooking spray. Whisk together the flour, baking powder and soda, and salt together in a mixing bowl and set aside. Using an electric mixer on medium-high speed, cream the butter, peanut butter, sugars, and vanilla, until light and fluffy, about 1 1/2 minutes. Stop the mixer to scrape down the sides with a rubber spatula. Add the eggs one at a time, and beat on medium speed until partially blended after each addition, about 1 1/2 minutes. After the last addition, beat until blended, about 30 seconds, stopping the mixer twice to scrape down the sides. Add the dry ingredients to the batter and mix with a spatula until the flour is absorbed. Then mix on low speed, until blended, 7 to 10 seconds. Scrape the bowl, especially the bottom. Add the chocolate chips and blend for several seconds. Scrape the bowl. Spread the batter evenly in the prepared pan. Bake the bars on the center oven rack until the edges are deep golden and the center in lightly golden and slightly puffy, 25 to 30 minutes. The center will drop when the bars are taken out of the oven, creating a chewy texture. Cut the bars into squares after they have cooled a bit on the rack. Who doesn't love peanut butter and chocolate? I had exactly 1 cup of graham cracker crumbs left and found this recipe on the back of the box. It was a cinch to throw together and very good for a bite-size snack. In a large bowl, stir together cereal, peanut butter, graham cracker crumbs, and sugar. Refrigerate for 1 hour. Shape crumb mixture into balls, using 1 level Tbls for each. Melt candy coating or dipping chocolate and dip each ball in coating, letting the excess drip off. Place on wax or parchment paper. Refrigerate at least 20 minutes or until set. Store in an airtight container. We celebrated K day with these really easy Kebabs. I cooked the meat ahead of time in a slow cooker and then cut up the veggies and broiled them. I seasoned the veggies with olive oil, salt, pepper, and grill seasoning ( I left the grill seasoning off the veggies the kids used to make their kebabs). We just added the meat at the table and I let the kids make their own kebabs. It was fun and a great summer meal! Place all cut up veggies in a large bowl. Drizzle with olive oil and sprinkle with salt, pepper, and grill seasoning. Combine with hands. Put veggies on skewers and put on broiler pan sprayed with cooking spray. Broil for 5-7 minutes, rotating pan if necessary. Add meat after done cooking. 1. Mix all ingredients in a slow cooker. Set on low and cook for 6 hours. stir occasionally. Add to kebabs when cooked through. This Barefoot Bloggers recipe, Parmesan Chicken, was chosen by Megan over at My Baking Adventures. This was easy, delicious, and definitely a crowd pleaser. My 6 year old son said "Mom, you're a genius! ", after he took his first bite. Hey, that is enough for me. Now go check out everyone else's results by clicking on the BB link above. Combine the flour, salt, and pepper on a dinner plate. On a second plate, beat the eggs with 1 tablespoon of water. On a third plate, combine the bread crumbs and 1/2 cup grated Parmesan. Coat the chicken breasts on both sides with the flour mixture, then dip both sides into the egg mixture and dredge both sides in the bread-crumb mixture, pressing lightly. Heat 1 tablespoon of butter and 1 tablespoon of olive oil in a large saute pan and cook 2 or 3 chicken breasts on medium-low heat for 2 to 3 minutes on each side, until cooked through. Add more butter and oil and cook the rest of the chicken breasts. Toss the salad greens with lemon vinaigrette. Place a mound of salad on each hot chicken breast. Serve with extra grated Parmesan. I have had my eye on the above cake for over a year now. I saw it in the April 2007 issue of Everyday with Rachael Ray and knew that I had to make it. I just couldn't find the right occasion. Well, today was my mom's birthday, so I decided today was the day. I changed it up a little bit, but used the cake and frosting recipe and it was delicious! 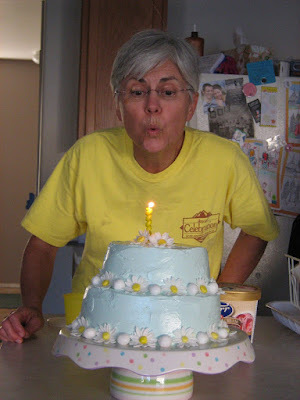 I have also learned some new cake decorating skills since that issue was published so I was able to make the flowers and designed the cake just how I wanted it to be. It turned out great! 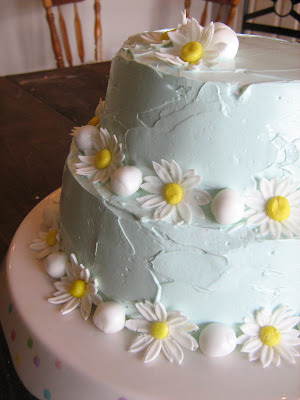 The daisies were a combination of fondant and gum paste and the little balls were just fondant. Raspberry preserves between the layers with a delicious swiss buttercream frosting. Is that the cleanest zesting job you have ever seen? My brother skinned that orange naked! I was amazed. 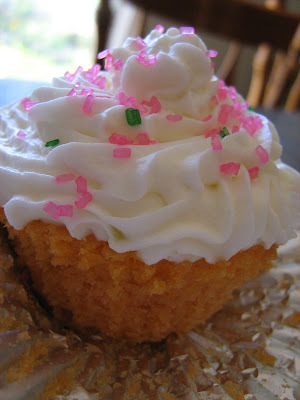 The cake had a delicious orange, zesty flavor and the texture was great. The family loved the frosting and praised it for being super light. 2. Using an electric mixer, cream the butter, sugar and orange peel at high speed until fluffy, about 5 minutes, scraping down the sides occasionally. Add the eggs one at a time, beating well after each addition. Mix in the baking powder, baking soda and salt and mix at medium speed, then mix in the vanilla. Add 2 cups flour and 1 cup sour cream and mix at low speed until barely blended. Repeat with the remaining 2 cups flour and 1 cup sour cream. 3. Spoon the batter evenly into the prepared cake pans, filling them about half full. Bake until the cakes are deep golden and a toothpick inserted into the center comes out clean, about 1 hour and 10 minutes. 4. Transfer the pans to a rack to cool for 20 minutes, then remove the sides of the pans and let the cakes cool completely. 1. Using an electric mixer, cream the butter and vanilla. In a separate heatproof bowl, whisk together the sugar and egg whites. Place over a pan of barely simmering water, whisking, just until the sugar dissolves. Remove from the heat and beat with clean mixer blades on high speed until the mixture cools to room temperature and forms stiff peaks, about 5 minutes. 2. Lower the speed and add the creamed butter a few tablespoons at a time (the mixture will look broken and curdled). Slowly mix in the rest of the butter until combined. Beat on high until smooth, about 10 minutes. Add a drop of red food coloring(I used Wilton Sky Blue gel paste) and beat until uniform in color. Cover with plastic wrap until ready to use. 3. 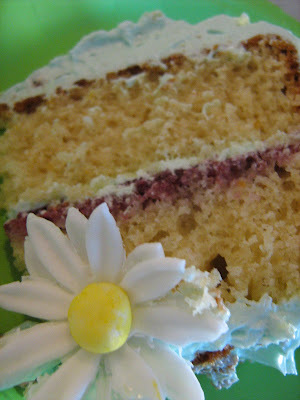 Using a long serrated knife, slice each cake horizontally into 2 even layers. Dab a bit of the preserves onto each cardboard round and place one corresponding cake layer on top. Spread the remaining preserves on the 2 bottom layers, then spread about 1/2 cup frosting over the preserves. Top with the remaining 2 cake layers. 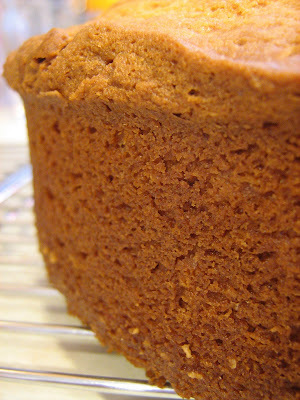 Apply a thin layer of frosting to each double-layer cake to seal in the crumbs. Refrigerate for 30 minutes to set slightly. 4. Cover the tops and sides of each cake with the remaining frosting, then place the small cake and its cardboard on top of the large cake. . 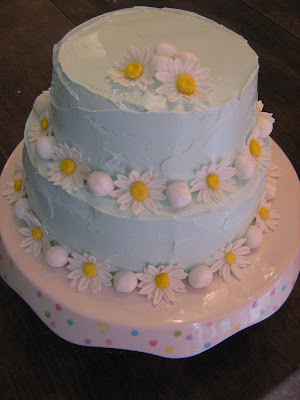 Here is a step by step guide on how to make gum paste/fondant flowers for cake decorating. I learned how to do this a couple of months ago, and I was intimidated before I went, but it is quite simple and so I wanted to share. First, roll out your fondant mat, grease it with Crisco, and grease your hands as well. Get equal amounts of gum paste and fondant, make them both smooth, by mixing in a little Crisco. Also make sure to remove any hard parts, because they will make lumps when you try to roll it out. Combine the fondant and gum paste until it is one uniform mass. Remember as you go to reapply Crisco to whatever needs it. This mixture (gumpaste/fondant) is very sticky and delicate, and the Crisco helps it not to stick or tear. Grease your small fondant rolling pin and roll out the gumpaste/fondant as thin as you can, also as evenly as you can. You should be able to see the lines of your mat clearly when it is thin enough. 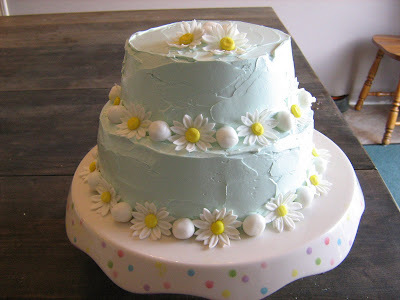 Using your fondant cutter, cut out as many flowers as you can. Make sure you press down firmly, so that the cutter cuts all the way through. Gently and slowly pull down the petals to curve them and lengthen them. Be careful, if you do this too fast or hard, you can break the petals. Ahead of time, make your gum glue. 1/4 tsp gumpaste dissolved in 1 Tbls or so of water. Break the gumpaste into little pieces and let it dissolve. And press another completed flower on top, alternating the petals, in between one another, so it looks like this. For the center, make a small ball of your gumpaste/fondant mixture and roll it in yellow luster dust. Be careful to wipe your fingers, because this dust gets everywhere! Dab some gum glue on the center of your flower and put the ball on top. Press down the ball to flatten, and carefully transfer to a small flower former. Continue with other cut-out flowers until you have enough for whatever you are making. 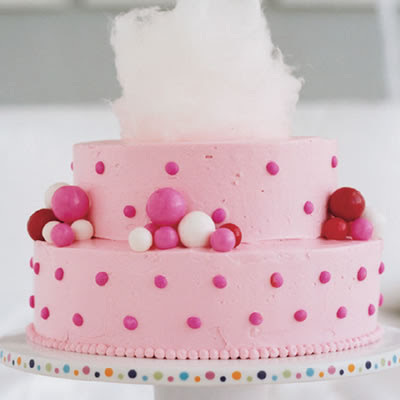 Remember also to keep all gumpaste and fondant that you are not working with cover tightly, so it does not dry out. When you are finished making all your flowers, place the flower formers on a cookie sheet and place the cookie sheet in a cool, very dry place where the flowers can dry for 2-3 days before you need to use them. This week's Tuesday's with Dorie pick, Mixed Berry Cobbler, was chosen by Beth over at Our Sweet Life. I couldn't fit in a another dessert and wanted to make my mom a special birthday breakfast, so I did a rewind and made Pecan Sour Cream Biscuits. They were light, golden, fluffy, and delicious. What do you expect? It's Dorie! Getting Ready:Center a rack in the oven and preheat the oven to 425 degrees F. Get out a sharp 2-inch-diameter biscuit cutter and line a baking sheet with parchment or a silicone mat. Whisk the flour(s), baking powder, salt, and baking soda together in a bow. Stir in the brown sugar, making certain there are no lumps. Drop in the butter and, using your fingers, toss to coat the pieces of butter with flour. Quickly, working with your fingertips (my favorite method) or a pastry blender, cut and rub the butter into the dry ingredients until the mixture is pebbly. You’ll have pea-size pieces, pieces the size of oatmeal flakes and pieces the size of everything in between– and that’s just right. Stir the sour cream and milk together and pour over the dry ingredients. Grab a fork and gently toss and turn the ingredients together until you’ve got a nice soft dough. Now reach into the bowl with your hands and give the dough a quick gentle kneading– 3 or 4 turns should be just enough to bring everything together. Toss in the pecans and knead 2 to 3 times to incorporate them. Lightly dust a work surface with flour and turn out the dough. Dust the top of the dough very lightly with flour, pat the dough out with your hands or toll it with a pin until it is about 1/2 inch high. Don’t worry if the dough isn’t completely even– a quick, light touch is more important than accuracy.